Marble votive relief. Macedonia. Ca. 420 BCE. Acquired in 1908 from Thessaloniki. 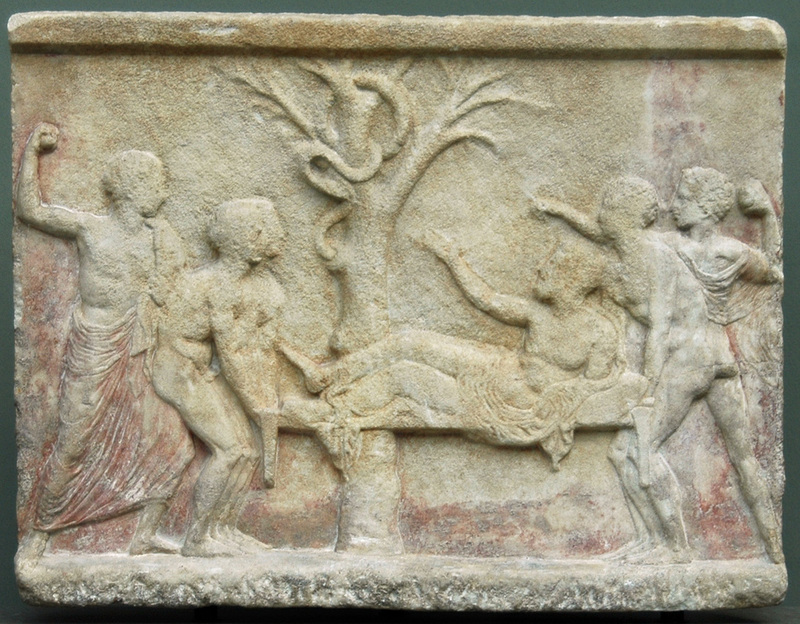 The relief shows a very well composed representation of a scene of healing. In the middle a large tree stretches its naked branches on which there may have been painted leaves (Reutersvärd 1960, 54). A large snake is winding around the tree trunk seemingly emerging from a hollow in the tree, and stretching its head towards the main character in the scene: a bearded man lying on a stretcher carried by three youths. The man is sick, he leans his elbow on a cushion and lifts his swollen (?) right leg towards the snake whom he also greats with his right hand. The scene is flanked by two young men throwing stones towards the snake, the one to the right is naked apart from a small cloak over his shoulder whereas the one to the left is draped in a large cloak. The composition is built up with the hand and leg of the sick man and the snake’s head in focus. The stretcher bearers, two on the left and one on the right are mirror reversed copies of each other, and their legs together with the left leg of the right hand stone thrower constitute a perfect zig-zag shaped frame on either side of the main scene. The two stone throwers are also mirror reversed, the one seen from the front, and the other from the back. The representation is unique, and the story told has been variously interpreted according to whether one believes that the young men are putting down the stretcher or lifting it, and whether the young men are throwing stones at the snake to make it disappear or at the tree to make the snake appear. Lippold believes that the scene is taking place in a local sanctuary in Macedonia where the snake is very popular. In any case the sick man is being carried out to a place where a snake lives in a tree, he greets the snake whom he expects to heal his bad leg, and asks the young people to set him down, pointing to the tree and perhaps exclaiming: “There it is!”. It seems strange that the young men should throw stones at the snake who is the theriomorphic incarnation of Asklepios so it seems more plausible that they were trying to make the snake appear. We may see two scenes, the one behind the other. In the background the two young men are throwing stones at the tree to make the snake appear, then the stretcher bearers come along with the sick man who rejoices in seeing his healer. The relief must have been a votive set up in a sanctuary of healing in Macedonia by a person who had been cured. The relief is low and the details are exquisitely carved. An interesting detail is the way in which the two figures to the right melt together as if it were one. Weathered on the surface, the heads of all but the right hand stone thrower being severely damaged. Traces of red colour below and on the sides in a broad border. A smoothly finished fascia above, a roughly cut one below. © 1995. Description: M. Moltesen. Catalogue. Greece in the Classical Period. Ny Carlsberg Glyptotek, 1995, pp. 130, cat. no. 67.